Time is our most valuable resource as business owners. As the saying goes we all have the same 24 hours in the day, so it’s all about how you use those 24 hours to get the most out of them. 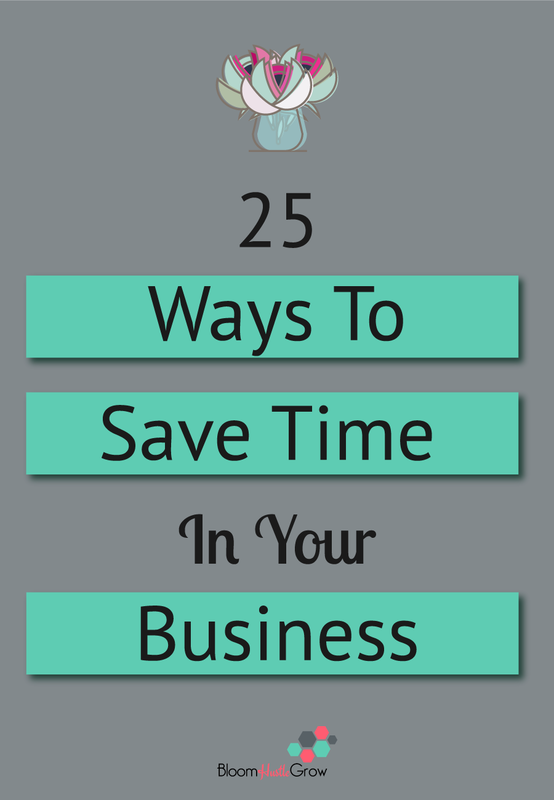 Below are 25 ways you can save time in your business and get more out of your day. Want more time for your business? Grab these 25 #timesaving tips! Switching between tasks has been shown to decrease efficiency and lead to mental fatigue. Our brains work better when focused on one main task. While this concept works better for our brains, it can also save time because you don’t have to take time setting up for new tasks. For instance, you probably use different tools for drafting a blog post, posting to Instagram, and making a graphic. By focusing on tasks that require the same setup, you will automatically save time. Sit down and schedule out your day. Part of the problem with keeping up motivation is that you get decision fatigue. Having to figure out what to do hour to hour is much harder than just sitting down and working on what is in front of you. You waste time on deciding or searching for your next task. Scheduling out your day saves you time because you know exactly what to work on next. Check out how I plan out my week/day here. The best way to know where your time is going is to track it! Tracking your time is a great way to better manage your time. It gives you a real picture of where your time is going and is often a wakeup call to re-prioritize your day. Check out this post for more on time tracking. Having trouble focusing, getting started, or making progress on certain tasks? The Pomodoro technique just might be your magic weapon to fix that. The basic technique is 25 minutes work sprints, followed by 5-minute break, done in 4 rounds with a longer break after the 4 rounds are complete. But it’s totally customizable, check out this post all about the Pomodoro technique. Yep, get organized. You would be surprised at how much time being disorganized takes away from your day. Pay attention to your day and fix those frustrations that come up that organizing would fix. Like searching for computer files, trying to find pictures, opening your closet and items falling out, the list can go on and on. Just stop and take time to fix those everyday annoyances. Read more about how to get organized in this blog post. Or if you’re not sure where to get started; check out this list of 15 places to get more organized. Even something that only takes a few minutes can add up to hours out of your day. Automating routines and processes that happen day in and day not only saves time but also can help to relieve stress. Here are 5 places to get started automating ASAP for your business. Start establishing processes for routine/regular tasks that are performed in your business. Having a set process to follow allows you to be consistent, and it saves time and mental space because you don’t have to remember what the next step is. It also allows you to be more ready to outsource tasks as you build your team. The only true way to expand how much time you have available in a day is to pay for it. Evaluate if you should be outsourcing certain tasks. An easy way to do this is by determining if you could make more money in the time it is taking you do accomplish that task than it would be if you paid someone to do it. For example, if it is going to take you 12 hours to edit your videos for a course, but you could take on a new client for a higher rate than you would pay for editing, then pay for editing. Your mind and body need refueling too. There is a lot of research on maximizing productivity, and all of it includes the need for breaks to maintain your mental efficiency. If you want to get more out of your day, you do need to create a balance of activities and take time to eat, exercise, and reset. This can be whole days, or simply blocks of time you reserve for certain activities within your business. For example, some business owners choose one day a week to deal with administrative duties, like catching up on email, invoicing, bookkeeping, etc. Other use block scheduling for meetings, reserving maybe their mornings for client or project work. Other find that creativity flows best when it’s uninterrupted by other pressures of the day and needs whole days committed to projects. This works best when you’ve identified how you work best, and then preserving that time for certain tasks based on your energy levels and what you need in your day-to-day. It’s kind of hard to effectively run your business and keep yourself motivated if you don’t have a clear vision of where you are going and why you are working so hard. Having clear goals can help with motivation because you know you are taking steps to achieve your goals and it ensures you are spending time on what’s important to your business. Never take on a new project/obligation without asking yourself, “what am I going to give up to make this happen?” No matter what when you take on something new it is going to take time away from something else in your life. This may be something you plan for, or it’s a consequence of not planning. So make sure when you say “yes” know what you are going to have to give up make that yes happen. Are Your Days Rocky Or Sandy? The Rock, Pebble, Sand, analogy for time management, I’ve read about this in 3 different books recently and not sure who it’s originally accredited to for creation. The basic premise is that you if you fill the jar with the rocks first, then pebbles, then sand you can fit much more into the jar, than if you had started with sand, you wouldn’t be able to find the room for the rocks or pebbles. Fitting it all in is a common problem for us entrepreneurs there is always demands on your time, which is why it’s so important that you recognize what is the rock, the pebbles, and the sand in your business to-do lists. Are you filling your days with sand aka all busy work or are you filling your days with rocks first those tasks that move your business forward? It’s important to find balance and make sure you aren’t just letting your days be all busy work (like social media, email, etc. certainly important parts of your business but they shouldn’t be dominating your days). Social Media can be a major time investment in business. A very easy way to help reduce that time commitment is to schedule your posts. If you don’t have a social media scheduler yet, put that at the top of your to-do list. Here are the ones I use. Content creation can take a big bite out of your time for most business owners. There are lots of ways to work to make your process easier. One such way is to try out talk to type. You can do that right in Google Docs under Tools –Voice Typing. There are also other apps that allow for this, just do a quick search. The other thing you can consider is recording yourself and sending it for transcription. Distractions can come in many forms, and if you work from home, the level of distractions present has at least tripled. Figure out your main distractions and figure out ways to avoid these at all costs. Distractions can come in obvious and sometimes not so obvious forms, for instance, the classic “social media is part of my job,” but that probably doesn’t involve watching cat videos or mindlessly scrolling (right?!). This might mean working not at home, putting your phone in another room, or utilizing apps that won’t allow you to open certain programs. Being too scheduled can lead to stress and kill your motivation. You should leave yourself margins to switch between tasks and not get overwhelmed. This means not scheduling meetings back to back or filling your daily task list with 100 items. Be reasonable with yourself and your schedule; you want to feel motivated not overwhelmed. As solopreneurs, we are our businesses. Our business depends on us being at the top of our games. An important part of being able to be efficient and productive is taking care of our most important asset OURSELVES. Our performance depends on our physical and mental health, so make sure you are scheduling in the time to perform those necessary tasks that keep your mind and body feeling its best. Work on balance by addressing your sleep, eating, exercise, and mindset routines. Read this post on how I’ve worked on finding my ideal “week”. This technique is all about tackling your toughest or most dreaded task first thing. That way it does not weigh over you all day, you approach it when you are most refreshed (meaning you are less likely to get distracted or procrastinate), and you get a motivational boost because hey you knocked that hard thing off and it’s only 10 AM! It’s an hour or two a day that you give yourself to work on creative projects and new ideas you want to implement. You protect this time from any other “busy” work and only allow yourself to work on a bigger project that will advance your business. This is one day a week or a month depending on your needs that you give yourself to examine strategy, do planning, and maybe do some administrative catch-up. If you often find you are caught up in the hustle without taking a step back from time to time than a CEO day is a definite addition to make to your schedule. Especially as a service-based business owner (but really all business owners) meetings and appointments can take up a lot of time and mental space. For some creatives, it’s hard to switch between meeting mode to creative mode. If you find yourself struggling with that, it might be time to establish certain days (or weeks) to appointments and other days (or weeks) dedicated to creative work. Creating routines for your business and day, allows your tasks and your day to flow more smoothly and without as much mental fatigue. Just like you can sometimes drive without thinking about it from say your home to the gym, routines can allow your brain to breeze through activities. I love the use of 90-day planning to provide focus to my day to day activities and a clear, actionable way to reach my business goals. A 90-day plan is just as it sounds, simply what you are going to do over the next 3 months for your business. Planning in 90-day segments allows you to be flexible in your strategy to best reach your overall business goals. You can read more about a simple way to approach 90-day planning if you are just getting started. All of these suggestions are really about finding HOW YOU WORK BEST! Develop your productivity formula. What’s your productivity formula? It’s figuring out ways to make yourself as focused, motivated, and productive as possible day-to-day. Give some of these techniques a try and figure out how you work best. Click here for few tips on experimenting to find your formula. Working on productivity takes effort, but it’s the best way to get the most out of your day. Not sure where to start? Take the productivity quiz and I will give you customized techniques to address your most pressing productivity struggle!